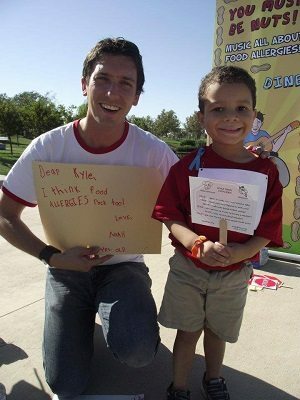 Kyle Dine regularly engages kids of all ages about food allergies, and he's learned a lot from them. After touring more than 600 schools across North America, reaching hundreds of thousands of children, Kyle Dine shares some of the key things he has learned entertaining children about food allergies. 1. Kids with allergies don’t want to be known for their allergies. While food allergies can often be top of mind for parents when thinking of their child, but not always true for children themselves. Like all kids, they want to fit in, make friends and be accepted. I love it when kids tell me about their interests and activities; those are the things that help define them, not their allergies. 2. Praise goes a long way. Sometimes a child comes up to me and is prodded to show me their medical ID by their teacher. I promptly give the child a huge high five and lay on heavy praise! Kids with food allergies are asked to do so much and it’s easy to get on their case when they slip up (e.g. forget auto-injector). Positive reinforcement helps to give them a boost of empowerment, knowing they are being responsible. Reminding kids to stay positive about their food allergies is part of Dine's mission. 3. Non-allergic kids genuinely care. After each show, non-allergic kids rush the stage to ask me more questions! They want to learn how to help their allergic friends, and tell stories of family members who have allergies. Many have never really had an opportunity to learn about the topic, and they get into it very easily. It’s important to reach kids when they’re young. 4. The need for education can present itself in ways you don’t expect. Although rare, sometimes a non-allergic child will ask a mean-spirited question about food allergies or a related school policies. Although it’s easy to get your back up, these are the true valuable moments that need to be used as educational opportunities to dispel misinformation. The fact that these students are curious to begin with is a good sign and it provides the opportunity to present the right info, and hopefully to flip their thinking. 5. It’s normal to get frustrated with food allergies. All of us with food allergies have endured a lot. Exclusion, teasing, embarrassment and general unfairness. I’m amazed by how many children with allergies have the resilience to not let these feelings bring them down. It’s cliché to say food allergies build character, but there is some truth to it. Even when a non-allergic kid asks a mean-spirited question, Dine says that's an opportunity to teach everyone. 6. Teachers can learn, too. 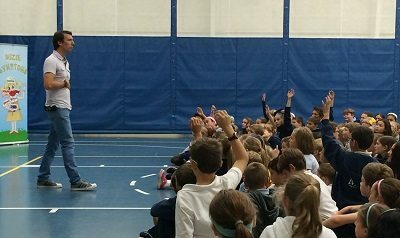 Although my assemblies are aimed at elementary schoolchildren, I pack a lot of information that may even come as a surprise to adults (e.g. handwashing with soap and water being more effective than hand sanitizer to rid of peanut protein). I love it when teachers raise their hand during question time to learn more, or ask me to repeat a point they feel needs to be reinforced with their students. 7. Kids can rock their food allergies! Many children ask me why I sing a song called “Food Allergies Rock!” I admit this title is not representative of the whole picture. But it helps me remind children to stay safe, stay positive, and keep things in perspective to live life to the fullest. 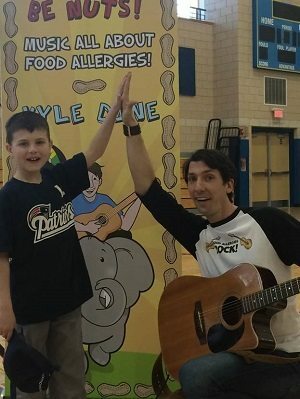 Don’t miss educator Kyle Dine’s DVD “Kyle Dine & Friends – Allergy Awareness with Music, Puppets and Games”. The 2-disc DVD set provides comprehensive allergy education for children ages 4-11 including quizzes and a resource guide. To order, visit www.foodallergyvideo.com.